Love Your Mountain Day winners! 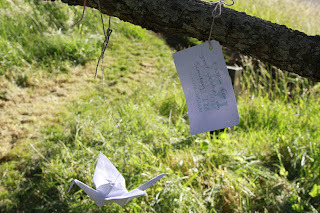 A group of us spent this afternoon putting up Koru on the 'Koru Trail'. Look out for them tomorrow. Looks like this wish is going to come true! Jean and Keith have been labelling some of the plants in our Batger Quarry work area: red for weeds, yellow for small native plants, and white for native trees. The labels, obtained through a grant from the Albert-Eden Local Board, include common, botanical and Maori names - and on some, a few words of explanation. Mary Stewart from Biosecurity, Auckland Council, joined us on 30 October, to arrange to take away the madeira vine infestations that Jeremy had discovered and removed from Tahaki Reserve. That's Mary, behind Jean. Jean writes: "There are more labels to come, this was just the first batch. Would you believe we struggled to find a good patch of tradescantia – ended up carefully weeding a little area of everything but tradescantia, to make it stand out." We'll be labelling more plants in the quarry area, in preparation for a guided walk led by Kit Howden as part of Love Your Mountain Day. Yesterday, instead of weeding the maunga as usual on a Tuesday, some of us joined a geology tour of Maungawhau, hosted by the Auckland Geology Club and led by Garry Carr, science teacher at AGS, as part of the Auckland Heritage Festival. The hypothetical nature of the science about what lies beneath the ground surface, or even visible on the surface, surprised me a little. It's still debatable, for instance, how many scoria cones there were on Maungawhau. Even the large basalt rocks in the wall that Garry's indicating here may not have come from Maungawhau (though they probably did). And there's "no pattern whatsoever" in eruptions from Auckland's volcanic field, Garry assured the anxious among us. Interesting too to learn that large boulders always mark the "toe" of a lava flow, as evident on the stoney hillock, an off-leash dog area, next to the playground at the northern boundary. Join us in a free guided walk on Maungawhau, led by historian and kaumatua Pita Turei. This walk is our contribution to the Heritage Festival. We particularly welcome the Deaf community. 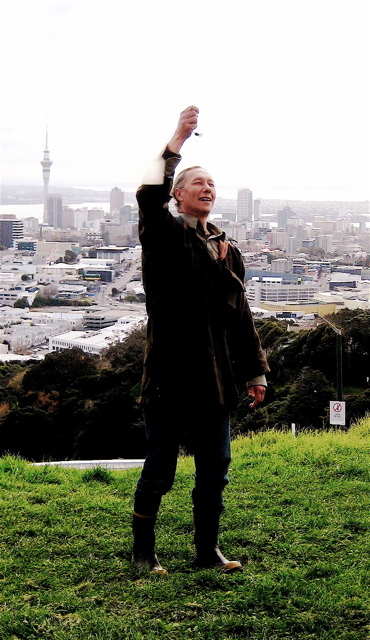 A qualified NZ Sign Language (NZSL) interpreter will accompany Pita as he relates the stories and history of our maunga through his oratory and performance skills. 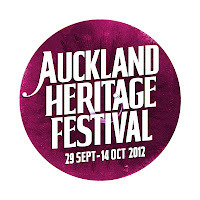 Other walks during the festival include a Maungawhau geology tour with geologist Garry Carr on Tuesday 2 October, 9:30 am to 12:30 pm, and several volcano walks and events related to Mt Eden. Ngarimu Blair on "The Original Jafas"
One of the founding members of the Friends of Maungawhau, Ngarimu Blair will be speaking in the Mt Eden Village Centre next Tuesday 11 September at 7:30pm. Sunday's planting day went remarkably well despite intermittent rain. Including six of the "usual suspects" – Dorothy, Jeremy, Sel, Kit, me and Keith – there were 23 workers, and they certainly did work. Not a shirker among them; a diverse bunch, each one with a particular skill. 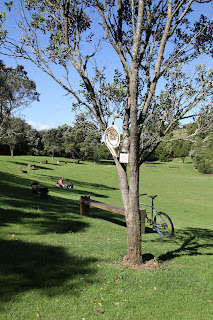 We arrived to find Kit had the plants attractively grouped and labelled, and had numbered the planting sites up the track above the Rautangi Rd entrance, using plastic tags funded by the Albert-Eden Local Board. The Local Board has also provided funding for 60 pairs of gardening gloves for our regular Tuesday weeding sessions. On reaching the site we found Kit's son had been busy planting a sizeable "demonstration patch" which gave us an excellent model to work from. 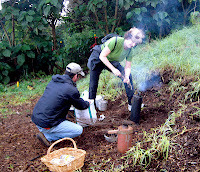 Our newly-purchased planting spades (courtesy of Auckland Council) made the job easier, but it was still heavy, dirty work. "Child labour" by four young boys was gratefully accepted. The mother with them explained cheerfully that their Dalmatian heritage means they are genetically programmed to dig; I later heard Sel saying to one boy, "You do realize there is no (kauri) gum here?" Tea break was welcome, with the "Benghazi boilers" doing their usual efficient job. A slight glitch occurred just as the boiling water began splurting from the spouts and amid general anticipation we reached for the tea – Keith and I had one of our "I thought you packed it" moments, rapidly resolved by offering coffee while Keith dashed home to get the tea. The mini chocolate bars were popular, as were the discount vouchers from Casa del Gelato in Mt Eden village, even if some of us were mildly hypothermic by this stage. Kit gave a brief talk on what FOM do, and current issues with Council. A great morning's work, with over 300 plants in the ground. Some people even had enough energy left to walk the track and see our patch; all said they would come to future planting days. Footage of the car being removed from the crater, care of the Central Leader. There wouldn't be any need for 'security' patrols if all vehicles were banned from the summit. 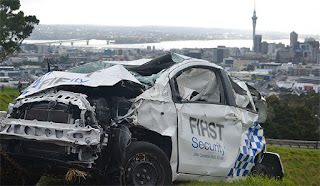 A ban would eliminate the theft problem and protect the maunga from this kind of idiocy. What puzzles us is why the vehicle was on the summit in any case. Isn't the gate on Mt Eden Rd supposed to be closed at 11pm? What if this had happened in summer, and the car had caught fire? Yesterday we joined a Wānanga Maunga organised by Auckland Museum. Archaeologist Louise Furey, kaumātua Pita Turei, and volcanologist Jan Lindsay led a two-hour walk-and-talk on #Maungawhau. We learned such a lot, and the morning ended with a scrumptious lunch! Thank you for the interesting Mātāriki programme this year, Auckland Museum. 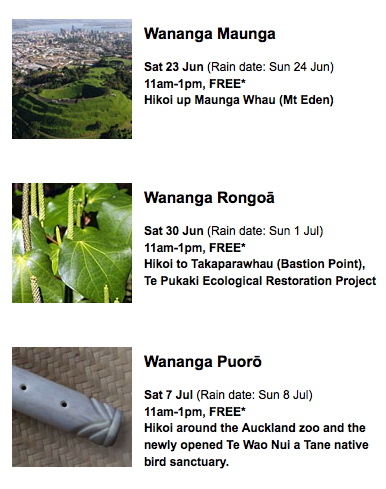 Help spread the word about our big day out on #Maungawhau! 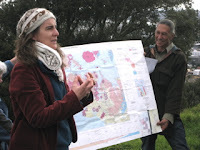 Wananga Maunga: "An off-site conversation between archaeology curator Louise Furey, tangata whenua Pita Turei, and volcanologist Jan Lindsay to make connections between collections and their relevance in Te Ao Maori. Special focus will be on archaeological specimens found on Maunga Whau; what our mountains represent and the significance to Matariki; and the present state of knowledge of volcanic risk in Tamaki Makaurau." The Wanaga Rongoā will be led by Ewen Cameron, Charmaine Wiapo and Rob McGowan, and focuses on native plant identification and regeneration, and medicinal properties of native flora and fauna. Numbers are limited: To book please email Nga Remu with ‘RSVP Maunga', 'RSVP Rongoa' and/or 'RSVP Puoro' in the subject line or ph 306 7070 extn 7178. Today three of us spent a couple of hours transporting cut branches of pine, privet and flowering cherry from the fenceline along the southern boundary to our work area near Hillside Crescent. We had tried planting there on Tuesday, but made slow progress with the loose rocky ground threatening to slide away underfoot. Digging a hole for a plant meant risking a landslide. So Jean suggested we terrace the slope in preparation for the next lot of plants. She managed to enlist Gerald, anti-drink driving campaigner and Hillary Trail runner, to apply his professional landscaping skills. Gerald will lay the branches horizontally across the slope, creating barriers to arrest the downward movement and stabilise the ground. Then we can put in more under-storey plants and, hopefully, they'll gain a foothold. 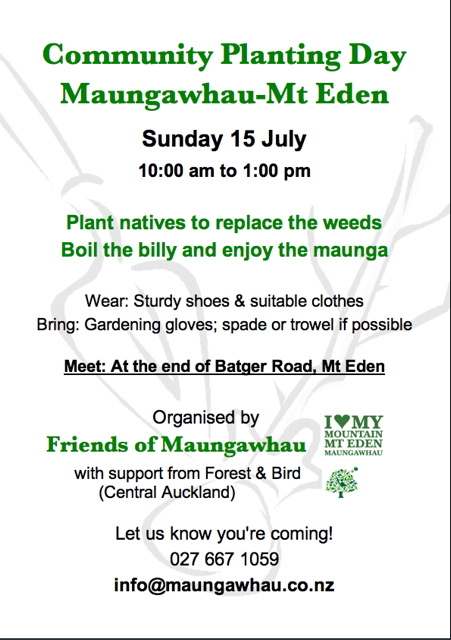 We'll have a community planting day on #maungawhau on Sunday 15 July. 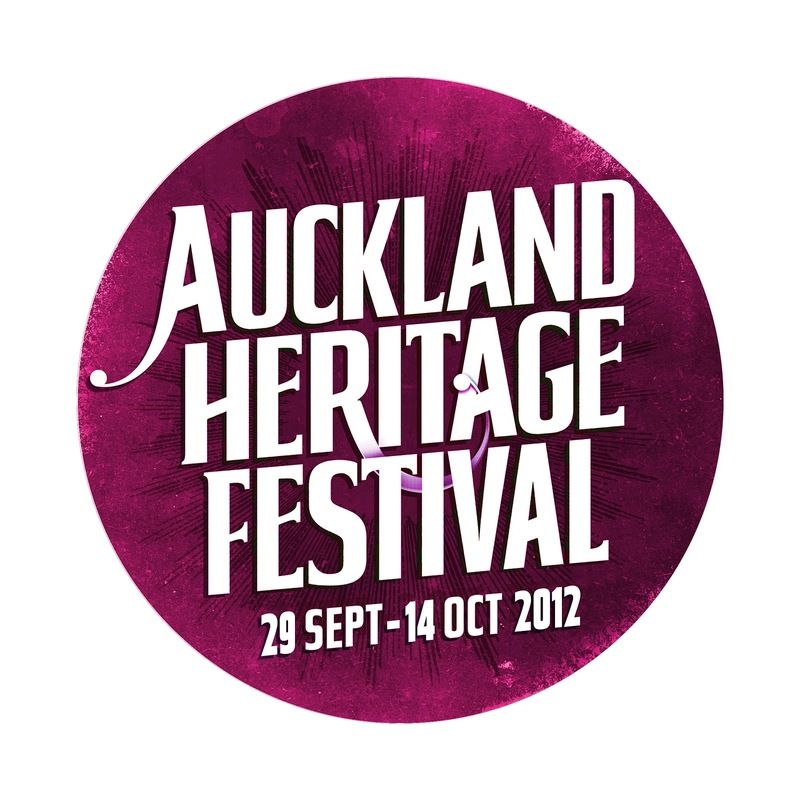 To be held in conjunction with Forest and Bird (Central Auckland). Help us plant natives to replace the weeds on the southern slope, then boil the billy to celebrate World Ranger Day at the end of July. For more information, see the Ecoevents site. 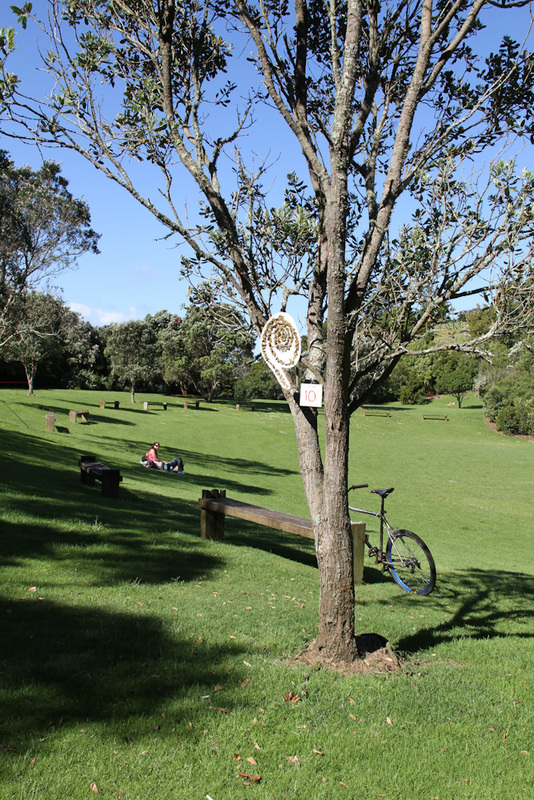 On Tues 12th June the Parks, Recreation and Heritage Forum of Auckland Council will consider two reports affecting volunteer work and the future of the volcanic cones. Doesn't encourage community input. Had a quick look and while good stuff and great words, very general and the reality of getting it done is not fully considered. In other words, very top-end planning – and maybe too “planese” – remote from public engagement. Does not deal well with conservation versus recreation conflicts on limited parks resource. PLEASE WRITE TO COUNCIL: That key community groups such as the Friends of Regional Parks (FOR Parks) and F&B and FoM etc be consulted as part of the next consultation process. There may be an over-emphasis with the CCOs having too great an input into the process, without it balanced with community groups having an input. Congratulations to the Tāmaki iwi and hapu, the government and Auckland Council on forming co-governance for the volcanic cones and landscape. For years the cones have been poorly managed and hopefully the new arrangement will put greater focus for improved management. A theme at the Rio+20 global conference this month is how to deal with human impacts that threaten nature, planetary boundaries and the few protected areas or parks remaining on the planet. One key is co-management based on giving authority back to indigenous people in association with government and the local community. Pressure on our volcanic parks and green space will increase as Auckland grows. For example, view shafts need to be better protected, tracks need to be better maintained, old quarries stabilised, weeds controlled, boundaries clarified and recreation use monitored so archaeological features are protected. Over a decade ago a group of concerned citizens including young iwi leaders formed a voluntary group, the Friends of Maungawhau, to campaign for better governance and understanding of the volcanic cones we live on. Active volunteers are still working to restore a 130-year-old quarry on the side of Maungawhau-Mt Eden. Restoring the neglected cones is a huge task. It needs more frontline commitment, not just from iwi, government and council, but from local communities and volunteers too. The Auckland volcanic cones Treaty settlement was initialled yesterday. On Radio NZ this morning Ngāti Whātua o Ōrakei trustee Ngarimu Blair said that once the settlement goes through, the iwi collective will be able to look after the volcanic cones properly. "There'll be fewer weeds, there'll be more native biodiversity, there'll be more identification of the 1,000-year Māori history and heritage, there'll be more Māori art work, there'll be less damage to the archaeological sites by cows, there'll be visitor centres and cultural centres in time, so we're hoping there'll be a lot of change." Here we have Ian, Sonya, Kat and April meeting to discuss Social Media options for the Friends of Maungawhau website and blog. We threw around some ideas for the blog, and talked about ways to make it more user friendly and accessible. Tools such as Twitter and Facebook were looked at with the intention that in using these, we can connect to a larger audience more efficiently and effectively. As we were meeting at Newmarket School, we had three visitors (Odette, Eilleen and Virginia) come to share a little about what the children (and staff) are working towards in their school in terms of media. Currently, some students are preparing to create a short film about the Maunga with original music. We look forward to hearing more about this as it evolves. The story of Maungawhau by Newmarket School children using voki. about the history of the mountain. 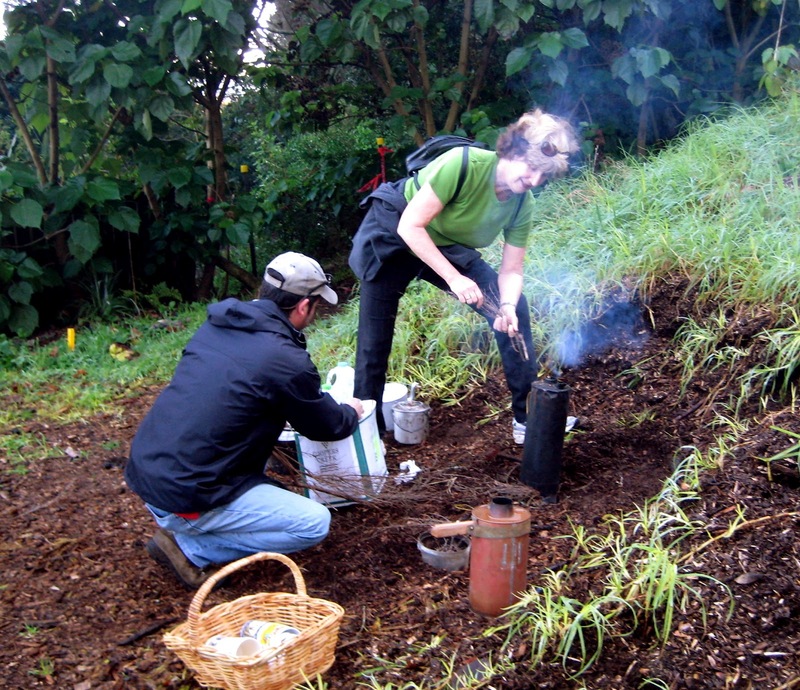 The Friends of Maungawhau is an incorporated society of citizens active in the conservation, protection and presentation of the international heritage volcanic cones of Auckland, New Zealand. We concentrate on Maungawhau, Mt Eden in Auckland. If you would like to help us or have any comments on issues related to Maungawhau Mt Eden please contact us. We have over 1,500 native seedlings to plant in Batger Quarry and on the lower southern slopes. 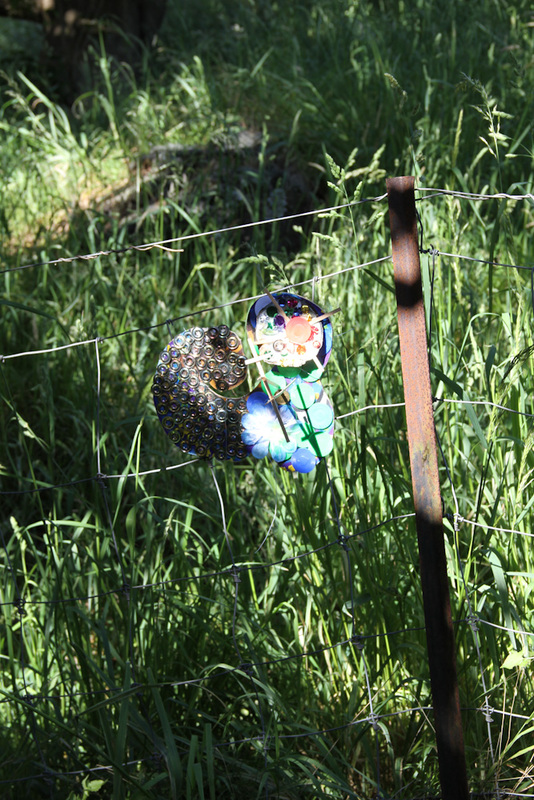 Volunteers will start planting on 29 May, continuing every Tuesday morning through June-July. If you're free on Tuesday mornings, please consider lending a hand. Gloves, tools, and refreshments are provided. Just turn up at 9:30 am at the end of Batger Road, or call our volunteer coordinator Jean on 630-7010 for more details. Public planting days on Saturday or Sunday will be scheduled soon. Check back here, or email us for advance notice. FoM chairperson Kit Howden will give a presentation on our volunteer work and current issues on the volcanic cones. All welcome, especially new members! Nominations for the positions of chair, secretary, treasurer, and ordinary committee members will be accepted until 29 May 2012. Email nominations to info(at)maungawhau.co[dot]nz. We look forward to seeing you at our AGM. Love Your Mountain Day: Just two weeks away!